I'm a little confused on how to accurately answer this problem. We have had similar ones in class but each uses a different method. July 25, 2017, 1:33 p.m.
First, you will have to look at the titration curve of diproduct. to see how much OH you will need to reach the first and second equivalence point. Next look at the volume of a, b, & c to see where are you on that titration curve in relation to the equivalence point. In your worksheet you are focus on the water whereas you should be focusing on the weak acid itself. 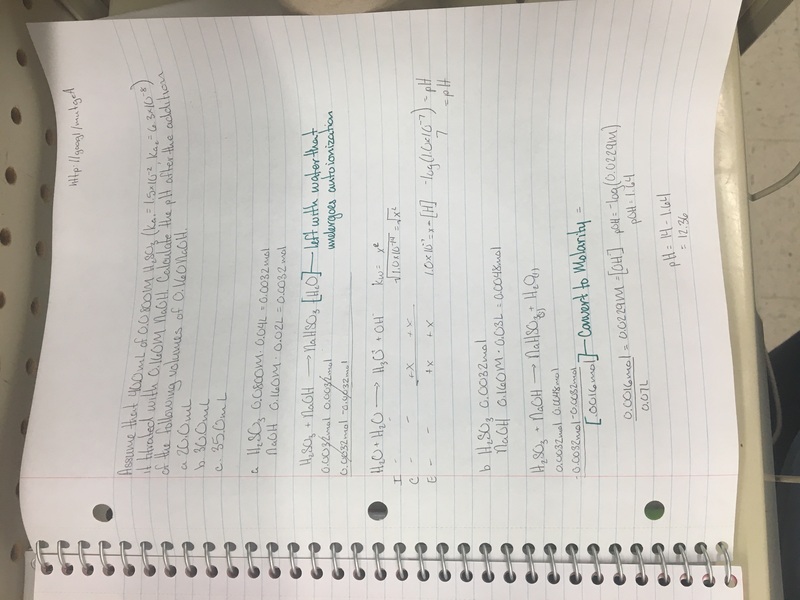 Once you understand the significance of the volume in relation to the titration that should help you understand how to solve this problem. Also if you refer to the example problem in the textbook on page 736 example 15.9 this should help you get started. If you have further questions please let me know.